I am a publicist and social media manager in the search of a great job which I promote to the top. I am a great employee, honest, punctual, with strong social and fun skills. I´m working as a freelance creative in charge of developing online campaigns and management of social profiles for different companies. Development of marketing plan and definition of advertising channels. Address: Alvarado 800, Bahia Blanca, Buenos Aires. I worked in charge of the overall administration of Hitech. Purchases, stock and dealings with suppliers. Also supervised the technical laboratory as director. Address: Brown 83, Bahia Blanca, Buenos Aires. I worked as technical service support of Speedy Telefonica S.A. . I worked as a technical operator providing telephone customer service and resolution of problems related to the service of data networks. Help Desk. Address: Hipólito Yrigoyen 3883, Bahia Blanca, Buenos Aires. Computer science professor in charge of afternoon shift. Dictating classes at different courses (Tools Office, Tango Management, graphic design, Web Design). Address: Drago Luis María 88 - 1P., Bahia Blanca, Buenos Aires. I worked as an operator of photocopiers in the student center "Biocentre", Universidad Nacional del Sur. Address: 12 de Octubre 1180, Bahia Blanca, Buenos Aires. Graduated with guidance in Natural Sciences and Food. Average 9.1 . Honorary Medal for best average 2001. CMO y tutor de estudios en Social Media Institute. Training in social skills to lead working groups. 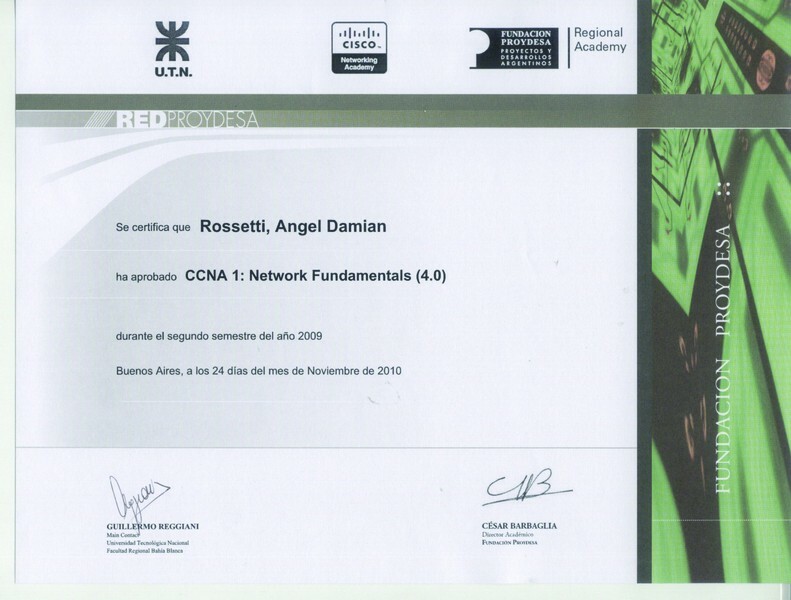 Design, assembly, deployment and management of data networks, Cisco certification (CCNA). Assemble structures, data cables and mounting tabs. Knowledge in fiber-optic networks. Since 2007 I've trained in various courses, workshops and academic level, doing part of the electronic engineering degree, with international certifications Cisco IT Essentials & Networking CCNA, backed by National University of Technology. Management of social networks such as Facebook, Twitter, Pinterest, Tumblr, Google and Linkedin. Management skills and monitoring of social networks. Metrics, engagement and brand positioning. My goals as a professional in information technology and Social Media are to continue training and developing new tools to improve my skills, as well as to contribute my knowledge and resources to the company where I work. I like sport, practical football lounge, and enjoy outdoor recreation. I am currently dedicated to photography as a hobby and I like to travel to new places.